This is the third season of the series “Working!! !” I originally reviewed the first series back in 2011, but did not review the second. The second series pretty much follows on from the first, adds a couple more characters but doesn’t really break any new ground. 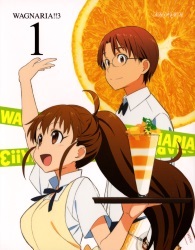 The franchise is set in a family restaurant called Wagnaria, which the décor and name are seemingly based upon real Japanese family restaurant chain Saizeriya, but with the food more in line with other major family restaurant chains, not Italian influenced like Saizeriya. High school student Sota Takanashi is suddenly asked in the street to join the staff of the family restaurant by Popura Taneshima, a very short 17-year-old (a year older than Sota) whom Sota mistakes for a primary school student. Sota has a fetish for cute animals, children and small things in general so immediately says yes without thinking. He latter feels duped by the fact Popura is older than him, as due to way he is treated by his older sisters he has a distrust of girls over the age of 12. Sota soon discovers the staff are bunch of oddballs; waitress Mahiru Inami who is a teen girl who has androphobia and punches Sota whenever he is near, Yachiyo Todoroki a woman in her early 20’s who is the head waitress, always carries a katana and dotes on the layabout manager Kyoko Shirafuji, a former gang boss in her high school years who does not much else but eat parfaits that Yachiyo makes for her. The kitchen staff includes Jun Sato who is a chain smoking chef who has the hots for Yachiyo but doesn’t have the guts to do anything about it. He is assisted by Hiroomi Soma who constantly teases Sato about his lack of progress and finds dirt on the waiting staff so he can blackmail them into doing chores for him. Running the restaurant is Hyogo Otoo who is mostly away due to the fact he is constantly searching for his wife who gets lost quite easily. He will return irregularly from time to time bringing back souvenirs in the form of local snacks to appease Kyoko. One day he returns with a teen girl who calls herself Aoi Yamada. It soon becomes apparent she is a runaway, but she stays on to become a member of the wait staff. This is despite the fact she is hopeless at her job, often slacks off and ends up living in the restaurant’s attic. She’s also very clingy and keeps bugging Otoo to adopt her. We are later introduced to Sota’s sisters; Kazue who is a hardnosed lawyer in her early 30’s, Izumi who is in her late 20’s and is a frail writer of romance novels, Kozue an aikido instructor in her mid 20’s who is seemingly always drunk because her relationships don’t work out, and finally Nazuna the youngest at 12 years old. In one way or another all of the sisters make trouble for Sota. The first series ends with Sota attempting to cure Mahiru of her androphobia and partially succeeding. The second series is pretty much a continuation of the first (with the animation quality going up quite significantly). A bunch of new characters are introduced such as Otoo’s long lost wife Haruna, Mitsuki and Yohei Mashiba who are a pair of siblings who used to be in Kyoko old gang and are still fiercely loyal to her and Kirio Yamada and high school boy who claims he is the brother of Aoi and is looking for her. The third series has sense of finality to it. The relationships of Sota and Mahiru as well as Yachiyo and Jun begin to blossom. Several other long running plot lines are resolved including Aoi’s and Otoo’s. I really didn’t expect to enjoy this franchise so much. I mean it’s pretty much just a silly little show about teens who work in a family restaurant. There are a lot of overused and long running gags such as Mahiru punching Sota, Aoi’s utter incompetence, the oddness of Yachiyo, Jun and Kyoko’s interpersonal relationships etc. However most of the time a lot of these elements are used fairly sparingly and the constant addition of new characters certainly inject a lot of humour into the show and keeps things fresh. Based up on a four-panel comic strip manga which ran for 9 years and 13 volumes, as you’d guess there is more than enough maternal available for three series. The animation for all three series was produced by A-1 Pictures (“Sword Art Online”, “Anohana”, “Erased” etc) and as you’d expect it’s mostly high quality stuff. But I think towards the end of the third series the animation wasn’t up to the standard of previous episodes. The series director was Yumi Kamakura (yes, yet another female director, and this seems to be her first time as series director), who is probably best known as an episode director for the studio, but also wrote the screenplay for the Kickstarter backed “Santa Company”. Her direction is pretty good and as a whole and meshes quite well with the previous two series. As I mentioned previously, there is an overwhelming sense of finality with this season of the show. The seriousness and drama at times almost overwhelm what is meant to be a slice of life comedy. But at the same time it really is satisfying to see a lot of plot lines come to a conclusion. However nothing much has really changed in the restaurant itself by the end of the final episode, which I also found strangely satisfying. This series also introduces Sota’s mother. She’s always away from home due to her work (her job really isn’t explained clearly in the series) and seems to be loathed by Sota and his sisters except Nazuna who hasn’t seen much of her mother during her short life. The final episode (complete with faux fantasy story preview) is a 50 minute special which has Sota’s domineering mother taking him away from the restaurant and forbidding from making any contact with Mahiru. The whole episode feels forced and engineered for maximum drama where there didn’t to be any. It’s a rather sour note to go out on and seems really out of place when compared to the rest of the franchise. Apart from the animation which takes a rather noticeable nosedive I the latter part of this series, the other big problem I had with this show was its English language release. The first two series were released by NIS America in oversized chipboard boxes with a hardcover books full of artwork. The Aniplex of America version is spread out over two sets with a blu-ray keep case in a flimsy slipcase and a few postcards thrown in. The kicker is the price; for the same cost of either one of NIS America’s seasons of “Working! !”, you could only buy one of the Aniplex of America sets at the “discounted” price. Years after they entered the market, their pricing still shits me. And with no other English language alternative in the home video market, you have no choice. I would still prefer that Aniplex just put English subs on their Japanese releases and be done with it. Their US versions are near Japanese prices, but you’re certainly not getting Japanese release quality. No booklets or anything. They’re ripping off US fans. Despite my problem with the English language release of this series, the content of this show is pretty good. Certainly it’s not a classic show by any stretch of the imagination. It’s kind of silly, but there’s plenty of laughs to be found. The final episode did leave a bit of a sour taste in my mouth and the animation towards the end didn’t seem as good as what had come before it. But as a whole, all three “Working! !” series are great way to be entertained over the course of a few nights if you want something light and fluffy to watch. 7 out of 10. Remaining Backlog: Eight TV series, one OVA and three movies. In addition I am also waiting for the second part and movie of one TV series to be released before viewing it.